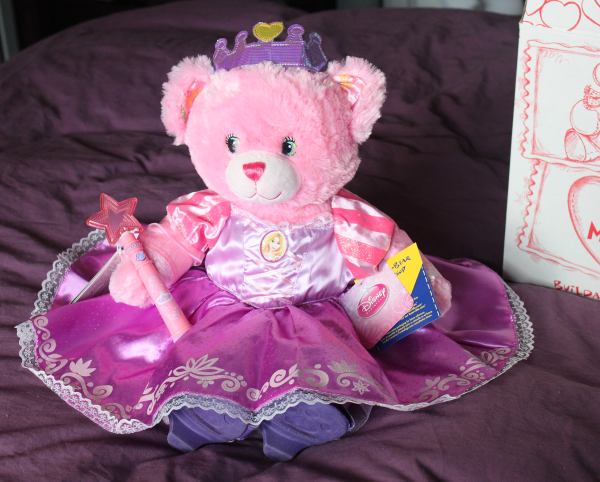 Beautiful Incentives: #BuildaBear Workshop #Review & #Giveaway #Win it! 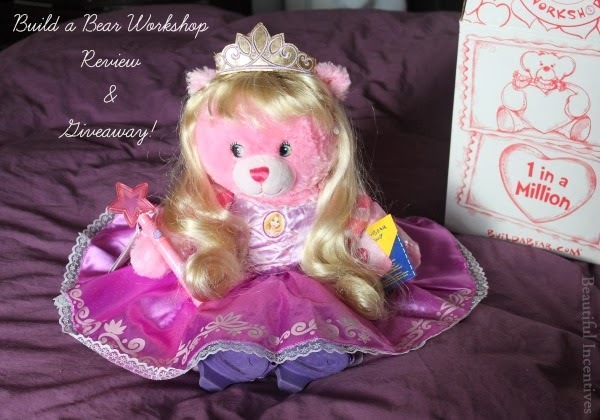 #BuildaBear Workshop #Review & #Giveaway #Win it! I'm excited to bring you another review & giveaway, courtesy of Build a Bear. You can see my first review on Twilight Princess My Little Pony here. If you are in search of the perfect gift for your little one or if you are a collector of limited edition toys, you will definitely want to check out this store. If you haven't heard of Build a Bear Workshop before, they are an online and in store stuffed animal extravaganza. In store, you can make a day of it purchasing your bear and then putting it together right then and there in their Build A Bear Factory. There are so many outfits to choose from. It's a great fun and creative experience for kids and families to enjoy. Workshops can be found all over in your local malls. They have every character you can think of, including ones from Disney, like the one I'm showing you today. I received the limited edition Royal Disney Princess Build a Bear and I absolutely love her. She comes with a full beautiful Princess Ensemble, that includes so many different features. This Royal Princess is a Rapunzel themed bear and she is so incredibly cuddly soft in a powdery pink shade any little one would adore. Golden crown that glows in the dark. The 16 inch bear itself costs $23 and the whole set mentioned above is $62 in total. 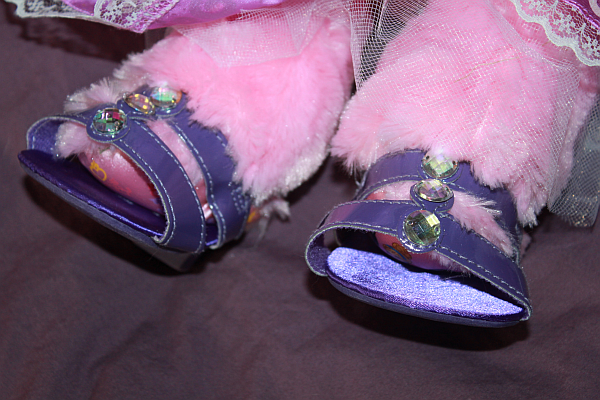 Everything is really easy to attach to the princess, with an elastic that comes included on each piece. 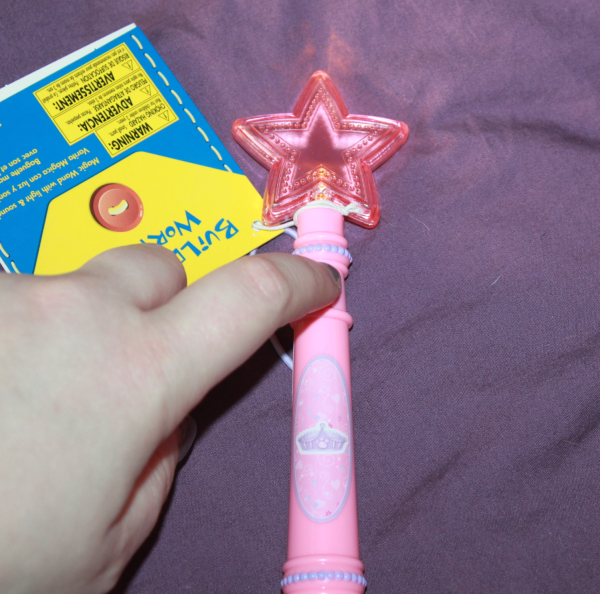 The light up wand is very bright and would make for a fun play toy. It really gives the illusion of magic for a little girl. Look how beautiful these shoes are. Personally, I love her to see her with and without the wig on occasion. I think both ways are cute. Everything is made very high quality as you can tell by the closeups. You will not be disappointed in this beauty, nor will your little one. There are so many things to do with this limited edition Royal Disney Princess Bear. It will be hours of fun reenacting a fairy tale with her. Every Build a Bear comes with their certificate of authenticity and his/her little house. In this line of Disney Princess's, there is also a Cinderella, Sleeping Beauty and Belle Build a Bear! HURRY, there is limited availability in all these! And now i'm excited to offer one lucky winner a $25 Gift card to buy their own Build a Bear or outfits! Beautiful Incentives is not responsible for prize fulfillment. This review and giveaway is in accordance with FTC guidelines. I'd get the Tons of Love Elephant. I would get my grandson the red fox. My daughter would love sleeping beauty. My daughter would love to have the Disney Palace Pets Pumpkin. My daughter would want one of the My Little Pony ones! We would get the hippopotamus, so cute. I'd get the 15 in. Girl Scouts Coconut Caramel Bear. The Red Fox is so cute! I would love to get a Pink Hearts Hello Kitty! I would love to get a my little pony. I would get the spiderman bear for my grandson. I like to get Spiderman Bear. I would get my niece the sleeping beauty. I'd like to get the Happy Hugs Classic Teddy Bear. Thanks for the giveaway! I like the 18 in. Cheerful Monkey. Sleeping beauty is really cute! My niece would love it. they have a limited edition seahawk superbowl shirt that I want to get for my kids bears! My daughter would love the 17 in. Tons of Love Elephant. thank you!! We would get the 16 in. Champ - A Champion Fur Kids Bear from Build a Bear if we won. would get the panda for my nephew. I like the 17 in Shimmerin' Shamrocks Bear. i want the shimmerin shamrock bear! I'd love to get the girl scout items for my baby girl. I would love to get the Spider-Man Bear. My daughter would love the pink hello kitty! Gotta get a cute outfit. I would get the 16 in. Champ - A Champion Fur Kids bear from Build A Bear if I won. I think she would like the hello kitty slippers or the black guitar. I want the I Heart Cookies Girl Scouts Coconut Caramel Bear for my Girl Scout! We would get the 16 inch Bearmy. I would like the 16 in. Spider-Man Bear, he is just adorable and my grandson would love him. I would get the 16 in. Big Top Bearemy! I would get my son the Happy Hugs Teddy bear. I'd like to get the WWF Red Panda. My daughter would probably get Sleeping Beauty Bear! My grandson would like the 18 in. Cheerful Monkey. I would like the penguin! I would get the 15 in. Lil' Almond Cub. Our toddler really wants the spiderman bear! I would probably get the lucky kitty, or one of the other cats that they have but you know how minds change at the last minute. I would get the Black & Fuchsia Heart Dress and a crown. My daughter would like the Disney palace pets pumkin. we would get the Pink Hearts Hello Kitty. We'd be shopping for our bear a new easter dress! My granddaughter would love to have the Cinderella bear. I'd get the Hello Kitty for my daughter! I would get a crown. My little pony is a big deal in this house right now! Thanks so much for the chances to win for my daughter. I would get the Pink Hello Kitty! My niece would get Hello Kitty. My niece would love Hello Kitty.